Clear and effective structures for responsibility distribution ensure that SEB's sustainability efforts address relevant issues and that they are implemented across the entire company. Strong ethics, effective governance and adequate reporting underpin our sustainability work. The Board of Directors is responsible for deciding on SEB’s Strategy and sustainability approach. As applicable, matters are dealt with by the board or by any of its established committees: the Risk and Capital Committee; the Remuneration and Human Resource Committee; and the Audit and Compliance Committee. The President and Chief Executive Officer decides in the Group Executive Committee (GEC) on the development and the execution of the corporate sustainability approach, in line with the strategy set by the Board. The President has assigned an operational steering group, the Corporate Sustainability (CS) Committee, responsible for SEB’s sustainability activities. The CS Committee is chaired by a member of the GEC (Chief Marketing and Communications Officer), and includes senior representatives from all divisions as well as applicable Group Functions, including Group Sustainability. 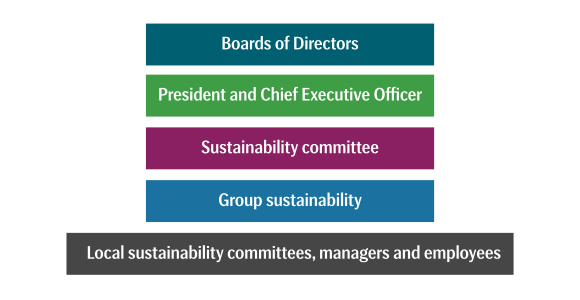 Group Sustainability is responsible for coordinating and driving the overall sustainability agenda within SEB, ensuring implementation in accordance with the directives of the Board, and for reporting on progress. Each head of division, business area and group function is responsible for ensuring that activities are carried out and instructions are in accordance with applicable policies, such as the Corporate Sustainability Policy.